Where do you go to when you need a specialized type of audio equipment? If you are a seasoned gadgeteer, you would quickly answer that you would be running to go to Sennheiser. After all, they are known for various types of audio equipment that not only give you the right amount of comfort but also do give you the best type of performance. Right now, Sennheiser has got the PMX70 Sport headphones which are currently being sold for £30. These are gym headphones which just fit anybody’s head just right. Yes, it does not matter if you have a huge head or a small one. They just fit snugly on and around your neck’s back without being uncomfortable at that. You would find the speakers to be snuggled just right in your ear. And since they are sporty headphones, there is no need for you to think that they also might just fail if you do try them out somewhere sporty – like the gym. You see, no matter how hard you jump around, the headphones just stay put. And despite you sweating out greatly during your workout, you need not worry for they have been made to be water (or sweat) resistant. And since we are talking about headphones here, the audio that comes from it is good. Bass goes through clearly as well as the vocals. But you will find that the sound from the environment still could be heard, though. And by the way, you might not like the color. I cannot describe just how green it is. Too unusual for me. Sometimes you just might wish it were black. Jill, is a 32 year old native of Ireland, has been specializing on iPod-related articles, Apple iPods, iPod Mini, iPod Shuffle, iPod Nano and all fresh iPod News. 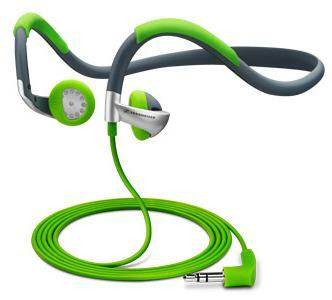 This earphone is an ok earphone but its not really good for sport and its over priced. Have a look at the Soundwise S6 is been designed for sport and it shows.